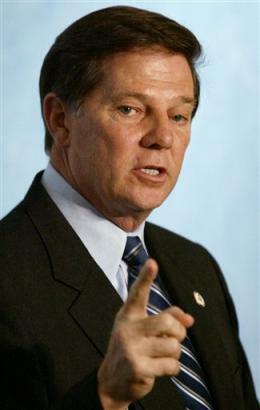 Thomas Dale "Tom" DeLay is a former member of the U.S. House of Representatives who represented Texas's 22nd congressional district from 1984 until 2006. He was Republican Party (GOP) House Majority Leader from 2003�2005, when his legal problems forced him to step down. Two former senior aides to DeLay have been convicted in the Jack Abramoff scandal, and though the infamous lobbyist was closely associated with DeLay, the former congressman himself has not been legally implicated. In 2005, a Texas court charged DeLay with criminal violations of state campaign finance laws and money laundering. DeLay pled not guilty, claiming political motivation for the charges. He was convicted of money laundering in January 2011 and sentenced to three years in prison but is free on bail while appealing his conviction.